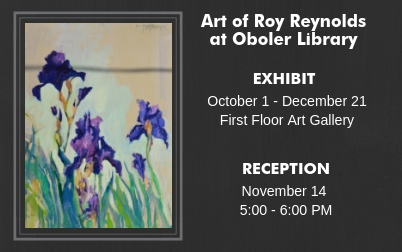 An exhibition of oil paintings by renowned artist Roy Reynolds opens October 1 at Idaho State University's Oboler Library, at 850 South 9th in Pocatello. The show runs through December 21 and can be viewed whenever the library is open; see isu.libcal.com/hours/ for the library's hours. Meet the artist at a reception Wed., November 14, from 5:00 – 6:00 pm. Born and raised in Idaho Falls, the region's landscape, people and architecture have served as inspiration for much of Reynolds' artwork throughout his life. He left Idaho Falls to study art at the University of Idaho and then at the Art Center School in Los Angeles. After schooling, Reynolds returned to Idaho and spent years as a cowboy, sometime artist, and worked on the side as art director for singer/songwriter Carole King. He gave up the cowboy life to work as an illustrator and graphic designer for the Idaho National Laboratory for 25 years. Upon retiring in 2000, he found a studio and started to paint and sculpt full-time. He won the commission for a bronze sculpture on the Idaho Falls greenbelt; The Fur Trader stands on Memorial Drive, depicting one of the men who paved the way for Lewis and Clark. In addition to numerous accolades, Reynolds' work has been exhibited widely, and can be found in many private and corporate collections. Asked about his style of painting, Reynolds said, "If I knew what I was doing, it wouldn't be worth doing. It would be mechanical. What I like about painting are the surprises that happen. Lots of times I struggle, but at other times, I'm pleasantly surprised at what happens. Those magical moments are what keep me painting." For more information about the art of Roy Reynolds, contact Chris Hatch at (208) 206-7908. For questions regarding art in the Oboler Library, send an email to austkris@isu.edu or call (208) 282-4073.